Good-Loop, an ethical video advertising platform, has been selected by Nestlé's open innovation platform, Henri@Nestlé, to run a funded pilot programme for its KitKat Sustainability Project. Unruly interim CMO Deborah Perlman with (from left) Audoyer, Williams, Carney, Lewis and Mazzeo. Good-Loop was selected as part of The Next Big Thing pitch process at ad:tech London. Yesterday (29 November), 15 start-ups competed to make it to the final round which took place today (30 November). The brief for the $50,000 (£37,000) pilot was to help Nestlé "bring home the benefit and value of our sustainability practices to our farmers, communities and consumers". The FMCG giant was also looking for a way to build on progress so KitKat could make an even bigger impact. Good-Loop's pitch was to use its platform to distribute opt-in ads to viewers. If they watched a video for 15 seconds, they would have the chance to donate half the price of the ad towards KitKat's Sustainability Project, selecting the branches of the programme they wanted to contribute to. Users could also opt to double their donation by sharing the ad or by providing their email addresses. 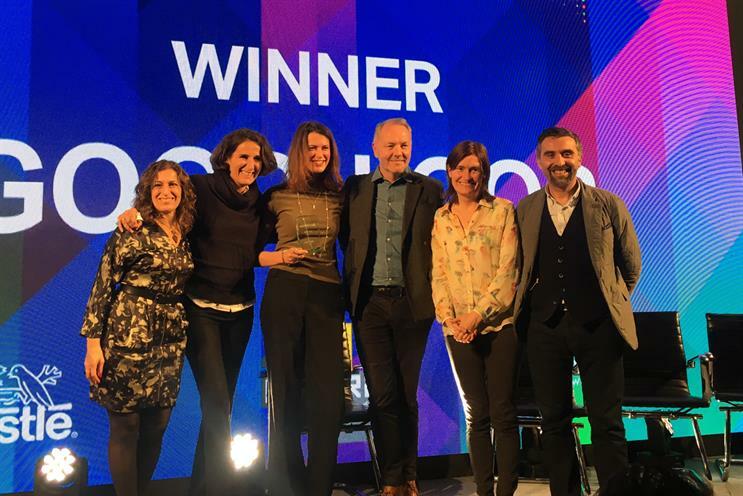 It was Good-Loop tech-for-good approach that won over the judges, Florence Audoyer, global brand manager, Nestlé said as she presented the award to Amy Williams founder and managing director of Good-Loop. They were joined on stage by Audoyer's fellow judges, Gerardo Mazzeo, global innovation director for Henri@Nestlé, Jon Carney, chief digital officer at McCann Worldgroup, and Rose Lewis, co-founder of Collider. Opinary - an interactive ad widget that invited users to share their opinions and provide content based on the opinion. Jaunt - a VR and 360°content creator and platform.